Created in 1998, Ariadna is a technological SME whose main core business consists of coordinating and developing innovative ICT solutions. For instance, since 2000 it has addressed several research projects in the areas of eInclusion, eHealth, Smart Cities and eParticipation. In particular, the company focuses on development of ICT projects tailored to the needs of each client In order to obtain this objective, Ariadna applies user driven methodologies in the development of innovation projects, obtaining results that are close to the needs of users and the market. Ariadna’s expertise in this area is highly valuable as proven by several successful projects. For example it assumed the methodological coordinator role for the CIP project PEOPLE, where it developed a user driven methodology for open innovation in smart cities. Moreover, it was in charge of evaluating and monitoring its four pilots. In addition, the company also co-coordinates two Spanish Living Labs: Madrid4Inclusion and eHealthMadridLL. The former aims at developing and applying ICT solutions in areas such as work integration and teaching for people with intellectual disabilities. The latter focuses on working for ICT application in areas such as the Hospital pharmacy or the Geriatrics service. Last but not least, since it was born five years ago, Ariadna has been involved in designing a new user centric open innovation methodology called Social Spaces for Research and Innovation (SSRI). Project proposal coordinator. Leading partner in charge of methodological aspects to be applied to the project. ICT provider and technical partner for the Spanish Pilot, that focuses in services that provide better life quality. HP’s offering spans from printing to digital entertainment solutions, through personal computing, software, services and ICT infrastructure. Founded in 1939 in Palo Alto, California, where its headquarters are, HP employs about 324.000 professionals, working in more than 170 countries, across six continents. HP was n.10 in the 2010 Fortune ranking. Department: HP-IIC (Italy Innovation Centre) is one of HP’s European Innovation Centre. Since 1999, it is carrying on applied research, technology transfer and innovative solutions integration in leading edge areas. It can rely upon an excellence level team of researchers, consolidated skills and methodologies, and a physical infrastructure supporting project development and demonstration. In particular, IIC is an excellence pole in HP about cloud computing technology, and has setup an internal dedicated lab for development and piloting in this specific area. HP Italy Innovation Centre (HP ICC) – the HP organization participating in the STORM CLOUDS project – has a very strong experience on Cloud Technologies, particularly upon OpenStack, Eucalyptus and OpenNebula.In addition, HP IIC has a strong experience in integration and migration projects to open platforms. 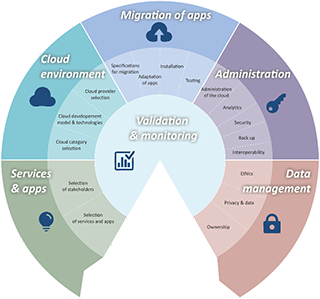 Main areas covered by the HP comprise the definition and implementation of the cloud platform, particularly addressing factors such as openness, security, re-usability and scalability. EUROPEAN DYNAMICS is a leading European provider of Information and Communication Technologies (ICT), content and promotion services provider operating internationally through its offices and antennas in Athens, Berlin, Brussels, Copenhagen, London, Luxembourg, Nicosia, Stockholm, etc. Among others, the company designs, develops, supports and promotes software ICT applications using integrated, state-of-art technology. Government sector – EUROPEAN DYNAMICS is a major IT services supplier for the government sector in international organizations, such as the Council of the EU, the European Parliament, the European Commission, and others. In addition, EUROPEAN DYNAMICS is a key technology provider to national administrations in Belgium, France, Germany, Switzerland, Denmark and other countries. Information Systems – Design and implementation of integrated ICT systems, databases and e-Records warehousing, web interfaces for information systems, Semantics, Ontology design and development “Object oriented” design and systems implementation (n-tiers architecture, Web Services, SOA, ESB, etc. ), software total quality management, information systems security audit & design, R&D in e-Government and e-business, User Training, Helpdesk/user support, etc. Telecommunications – Design, installation, configuration, operation & maintenance of advanced voice & data telecommunication networks, development of telecommunication system applications for enterprise networks & mobile operators. Electronic content and promotional activities – EUROPEAN DYNAMICS has a dedicated department for the provision of electronic content, promotional and communication activities and actions, serving clients such as the European Commission Directorate General for Communications Networks, Content & Technology (DG CONNECT former DG INFSO), the Publications Office (OPOCE) and others. During the course of these activities, EUROPEAN DYNAMICS has successfully organized numerous workshops and networking events for the www.epractice.eu website on eGovernment, eHealth and eInclusion and other DGs, as well as supplied content for various dedicated websites run by the Commission. The company has particular expertise in the provision of SaaS, e-business (B2C, B2B, B2E, B2G, G2G,etc. 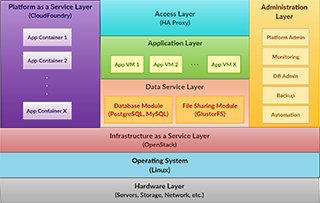 ), broadband services, e-Collaboration and workflow management, developing its own software applications and products, offered for web, intranet and Internet environments, relying on open architectures and Free/Libre Open Source Software (FLOSS). EUROPEAN DYNAMICS will be one of the ICT experts in the project, being responsible for the adaptation of the selected services and integration – deployment into the cloud infrastructure. EUROPEAN DYNAMICS will also be in charge of ICT critical horizontal issues such as data protection, security and privacy, interoperability and multilingualism (all very important towards scalability, reusability and sustainability of project results). RTDI is a private company funded in 2008. RTDI offers two different services. Firstly, it offers consultancy services specialized on technology brokering, R&D integral management, IPR management, Exploitation planning for innovative solutions, Business and Investment plans. RTDI serves clients from a variety of industrial sectors, mainly ICT, Chemistry and Energy. Secondly, it works in the area of robotics and software developments, introducing innovative R&D software based on artificial intelligence into other ICT products. It holds a vast network of collaborators at national and international level in the above areas, being energy efficiency and ICT the most relevant for the company. This network includes universities, research centers, regional development agencies, national and regional ministries, energy efficiency advisory boards, among others. Very important to STORM CLOUDS, RTDI holds the Presidency of EARIT (The European Association for Research in Information Technologies), a non-for profit association result of the FP7 HOLA! Project for which RTDI acted as project technical coordinator. HOLA was a Coordination Action addressing to support FP7 projects in the area of Cloud Computing and the so called Internet of Services (IoS). During the project, different dissemination and promotion campaigns, as well as workshops and international conferences were successfully organized. These included the annual organization of the well-known “Internet of Services Collaboration Days” from 2011. The project finished late 2012, and EARIT has taken its results from there, giving them sustainability and, at the same time, increasing the scope of support action to IoS projects. The Association aims at supporting European ICT businesses in the development of innovative ICT solutions and services through R&D and a clear orientation to market. The legal constitution of EARIT is expected for June 2013 and it is expected its support for the actions foreseen in STORM CLOUDS. RTDI will act as channel of this support, apart from our involvement in other activities. Apart from HOLA, RTDI has experience also in the participation in other international collaborative projects, including 2 FP7 STREPs, 2 FP7 CSA, 2 CIP-PSP Pilot B projects, 2 Eurostars, plus a few more national ones. HOLA! Portal (belonging to EARIT and leaded by RTDI) agglutinates 95% of all FP7 collaborative R&D projects in the area of Internet of Services and Cloud Computing (www.holaportal.eu). It will be a very useful tool for STORM CLOUDS when needing access to the most innovative cloud-based services of potential interest to the participant cities, as well as the stakeholders behind them. ITAKA: RTDI was responsible for delivering the IPR and Exploitation Plan for the European Integrated Project ITAKA. This project is devoted to the development of biodiesels for the aviation sector. NEFFICS: RTDI collaborated in the development of the Exploitation Plan for the European project NEFFICS for the ICT sector. “Channelling” EARIT’s support to the project, which will assure access to relevant results from R&D projects financed by FP7 in the area of Internet of Services and Cloud Computing, the relevant one for our project’s objectives. Also participating in activities related to business modelling for the exploitation of results. The URBAN AND REGIONAL INNOVATION Research (URENIO) of Aristotle University is a laboratory for the promotion of research and supply of technological services in the field of intelligent cities. URENIO is part of the Department of Urban and Regional Planning and Development in the School of Engineering, Aristotle University of Thessaloniki. URENIO is mainly involved in competitive projects from the European R&D Framework Programmes (FP), the Competitiveness and Innovation Programme (CIP), and the Innovative Actions of the European Regional Development Fund. The Unit took part in numerous projects funded by national and international research institutions and the European Commission. Main research fields of the laboratory:Innovation ecosystems development and government: Development, assessment and planning of innovative agglomerations, innovation clusters, technology districts, technopoles, science and technology parks, innovation centres and incubators. Innovation strategy development: Knowledge-based urban and regional strategic planning. Management of regional systems of innovation. Regional innovation strategies. RIS and RITTS projects. Measuring and benchmarking of innovation performance. Intelligent cities: Planning and development of intelligent clusters and districts. Living Labs. Intelligent city strategies and applications. Web platforms for collective intelligence, technology transfer, collaborative new product development, and digital marketplaces. User-driven innovation ecosystems and future Internet technologies. ALFAMICRO was founded in 1983, with the objective to do research, consultancy and engineering services to support advanced re-engineering and integrated IT solutions. Telecommunications, multimedia applications and Web Services complement the solutions developed and implemented in the field. ALFAMICRO also develops applied research with the aim to further develop the technologies utilized in the implementation of new working paradigms such as electronic commerce, digital collaborative business, dynamic virtual work environments, innovation networks, Living Labs, energy efficiency, e-Learning and semantic GRID with the objective of supporting companies to achieve sustained global competitiveness. ALFAMICRO has been involved in several EC Programmes e.g. : IST, TEN-TELECOM, ADAPT. IST participation and coordination as exemplified by: CITADEL; CITYSDK, PERIPHÈRIA, SAVE ENERGY, APOLLON, FIREBALL, PreCo, SMARTISAN, SCOOP, MOMENT, GEM Europe, Rural Wins, AFORO, PRIME, COMPANION, NEWTIME, etc. The company is/has been a member of the following European Networks: ICIMS-NOE, IiM-B, IMS, MOTIVATION, EXPIDE, BRIDGES, TRANSACT and participates actively in other national and international institutions (e.g. IEEE, ACM, Siggraph, SMPTE, etc.). ALFAMICRO provides a number of IT services to other networks of companies, such as consultancy and training in innovation culture and Internet/Web services for electronic commerce. Project coordination and management. Living Lab methodology applied to the project. Technical support to Lisbon pilot. Business architecture and models. Dissemination of project achievements and results at national, European and global levels. Sustainable Development: The environment and health with the unfortunate predominance of pollution are high on the Town Council’s agenda. This is why the development of Local Agenda 21 orientated towards 2016 is a key project. Valladolid has a firm commitment to becoming a sustainable city. Both the Town Council and the civil society have reached an agreement that this city should respect the environment and this is outlined in Agenda 21. Agenda 21 shows the municipal commitment to fighting climate change, specifically by reducing the impact on the environment and including environmental considerations in public contracts. Innovative experiments are also being carried out to develop ecological awareness and to preserve and improve the environment by promoting sustainable behaviour in all daily activities. Mobility and Urban Transport: Problems of mobility and security are among the main concerns of many of the world’s large cities. Valladolid is working to encourage people to use public transport and reduce the number of private cars, to increase pedestrian areas and improve the traffic situation. This is being done through urban measures and especially, with the introduction of new technology and new models of mobility in special, the electric mobility. Electric vehicle: The City Council of Valladolid, through the Agency for Innovation and Development, has defined a set of measures with the aim to promote electric mobility, encouraging their use, promoting and boosting demand for an infrastructure of charging points. The aim is to help both in improving the environment and environmental qualities, as in the development of new niches of activity associated with this innovative automotive system, strengthen the manufacture. Valladolid was the Spanish city chosen by Renault for the manufacture of the Twizy (EV) since 2011, it was chosen for its proximity to the Western European market. Citizen Participation and transparency: One focus of work is to improve the quality of life in our city thanks to the participation of citizens in managing it. We want to provide us with tools to drive this participation and leverage the collective intelligence of the city, developing the axis “Smart Citizen” Moreover, there are various initiatives underway related to open government and open data. The innovative initiative “Smart City Valladolid and Palencia” is creating relevant experience in Valladolid around STORM CLOUDS’s aims and objectives. It will be leveraged during the project. Developping pilot projects mainly in relation to Quality of life, supported by ASI as Pilot Leaders.Valladolid will also promote the work of the project through an active campaign of promotional campaigns. 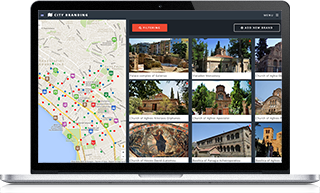 Thessaloniki is the second-largest city in Greece and the capital of the region of Central Macedonia as well as the capital of the Decentralized Administration of Macedonia and Thrace. Its honorific title is Συμπρωτεύουσα (Symprotévusa), literally “co-capital”. Municipality of Thessaloniki today has a population of 322,240, while the Thessaloniki Urban Area (the contiguous built up area forming the “City of Thessaloniki”) has a population of 790,824; making it the fifth largest and most populated city in the Balkans and the second most populated city that is not a capital, after Istanbul. Furthermore, the Thessaloniki Metropolitan Area extends over an area of 1,455.62 km2 (562.02 sq mi) and its population in 2011 reached a total of 1,006,730 inhabitants. Thessaloniki is Greece’s second major economic, industrial, commercial and political centre, and a major transportation hub for the rest of south-eastern Europe; its commercial port is also of great importance for Greece and the south-eastern European hinterland. The city is renowned for its festivals, events and vibrant cultural life in general, and is considered to be Greece’s cultural capital. Events such as the Thessaloniki International Trade Fair and the Thessaloniki International Film Festival are held annually, while the city also hosts the largest bi-annual meeting of the Greek diasporas. In 2014 Thessaloniki will be the European Youth Capital. So far, Municipality of Thessaloniki has implemented numerous projects related to entrepreneurship within the framework of ‘Local employment plans adjusted to local labour markets’ funded by the Operational Program ‘Human Resources’. Thessaloniki Municipality will cooperate with AUTH in all the activities related to the creation and management of the Greek pilot. It will focus on services related to contribute particularly to deploying Cloud-based services, as well as developing methodological framework and being in charge of exploitation and sustainability tasks. Águeda is a municipality in Portugal with a total area of 335.3 km² and a total population of 49,456 inhabitants (41,022 electors in 2006). The main city proper has a population of 14,504, while the remainder is distributed in 20 parishes, within the Baixo Vouga Subregion. Águeda Municipality is a founder member and a strong supporter of the Lighting Living Lab with the objective of promoting innovation and developing research of new technologies and applications related with lighting. In particular strong focus is given to intelligent lighting and eco-sustainable lighting concept, in order to raise new services and products. The Lighting Living Lab promotes and supports open innovation and co-creation of new technologies and applications in the field of lighting, therefore sustaining active participation of the end user as a basis for achieving greater energy efficiency and promoting a paradigm shift in lighting, which is no longer seen as a commodity but considered fundamental in the definition of environments, customization of spaces and comfort. Environmental protection and urban policy as well as developing and promoting their initiatives through exchange of experiences transfer of know-how and implementation of joint projects. In 2008, Águeda signed the Covenant of Mayors which is one of the most ambitious initiatives in the fight against global warming. This European Commission initiative establishes a commitment by 2020 to reduce emissions of greenhouse gases (GHGs) by at least 20%. It consists of a formal agreement to be fulfilled by cities and municipalities involved to overcome these energy policy goals set out by the EU through increased energy efficiency, cleaner production and use of energy. Águeda was one of the first Portuguese municipalities to adhere (at the time there were 27 European cities signatories and about 124 others waiting for accession). Currently, Águeda is an almost paper-free municipality due to fully digitalized services. Even processes that are still dealt in paper form, such as official letters and applications are scanned and treated via email whenever citizen’s electronic contacts are available. Certainly, Águeda is highly adoptive of new technologies that favour citizens, as well as more faster and efficient innovative tasks. Proximity to citizens; ability to mobilize citizens; ability to communicate new projects and funding of wills; demonstration of prior cases in which it achieved a quality of relevant results (with national awards); Co-funding of demonstration activities and access to national and European funds (investment and structural). Incumbent upon the municipality to ensure the integration of citizens in this process, explaining the process, informing the potential benefits, the technical characteristics of the various solutions. The municipality will also organize the whole bureaucratic process of each intervention in the area of project implementation, the execution of the work. Miskolc is the fourth largest city in Hungary. According to the latest census, Miskolc covers an area of 237 square kilometers and has 161.000 inhabitants and around 300.000 inhabitants with the agglomeration. Miskolc is the largest city in North-Eastern Hungary which makes it therefore quite influential in the region. Technology awareness is very high, with Miskolc being the home of 6 university faculties and 2 colleges, the city has a vibrant, tech-aware young flare to it. Smart-phone usage is high, and the city boasts a load of smart-city projects like transportation applications (OkosPont), smart-city programs like the Digital Miskolc program, or infrastructure programs to help citizens reach IT services (eg. around 17.000 notebooks provided to local residents in 2014). Above initiatives make Miskolc a good candidate to become a digital/smart-city. One of the biggest and most current public cloud infrastructure purchases in Hungary (apart from NISZ in Budapest) happened in Miskolc, to be able to provide a backbone to cloud applications and services. 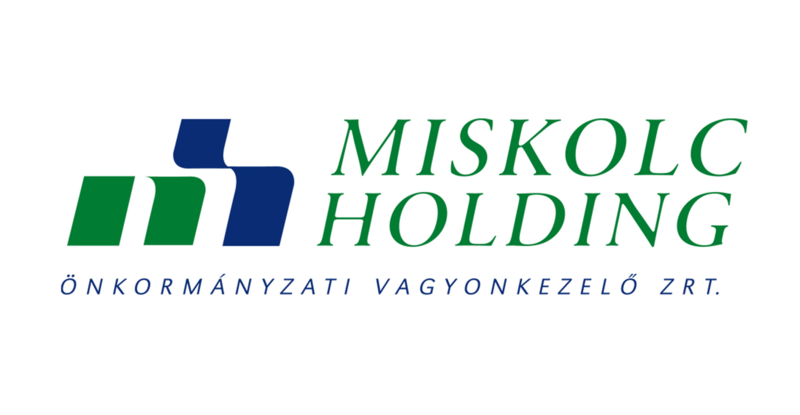 Miskolc Holding, the municipality holding company, will be in charge of this infrastructure, and will foster services and applications to be provided to citizens and tourists alike.